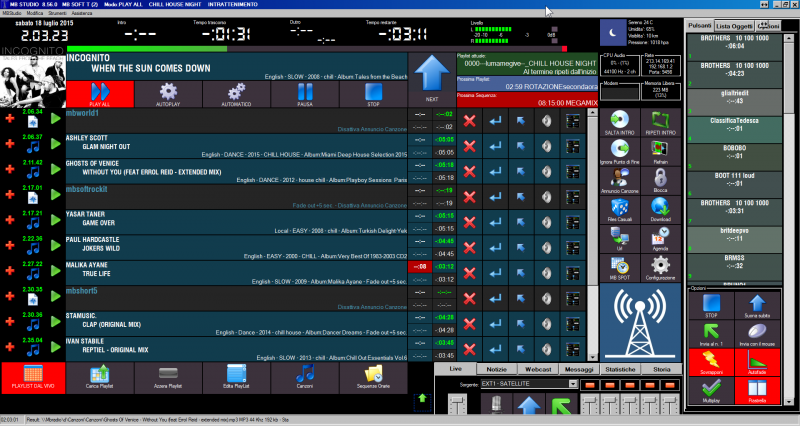 MB Studio is a automatically complete software to manage your radio or web radio easily and fully customizable. And ‘one of the most powerful and versatile software available on the market and does not need the least of any knowledge of programming languages scripting (PAL) to manage the program. MB Studio is native for Windows, but it works perfectly on the Mac via Parallels Desktop. For each license purchased of MBStudio, include 1 free streaming service Shoutcast or Icecast for one month (100 slot up to 192k). Aren't you sure which version of MBStudio 8 choose? See the comparison chart and choose the right version for you. 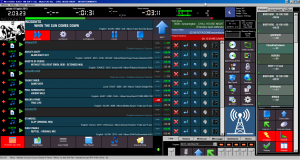 MBSTUDIO 8 is a powerful software for automatic radio direction. The audio player is very fast, has an automatic audio level and a compressor and supports all the most ‘common audio linear and / or compressed (WAV, MP2, MP3, MP4, AAC, OGG, WMA, FLAC) . The new graphic interface allows easy access to all functions, both during use in direct manual or automatic mode. The music archive imports songs from hard disk or CD cataloging them with dozens of parametric then allow the creation of playlists and music targeted clock. MBSTUDIO is very flexible and it can adapt to the music schedules of any issuer. The voice track allows the superimposition of vocal tracks on music, recreating, for the listener the sensation of a live program and to this end they do not forget automatic announcements of the title song on the air, the exact time, date and even the weather. Commercial programming handles all contractual deadlines (start date, end, choice of weekdays, programming days and / or every other week, exclusion from public holidays, etc) and allows you to set time limits advertising crowding and / or daily; the same type of programming is also applicable to information events, headings and / or programs. Full support for external contributions from satellite. In fact, you can connect to MBSTUDIO professional satellite receivers supplied by numerous agencies or sindacations, synchronizing the broadcast live or recorded content to disk for deferred transmissions. When grants come from the internet, you are using the download very evolved that automatically downloads any file and in case of failure of the download is used an address or a replacement file thus avoiding ‘unpleasant surprises at the time of broadcast. The legal obligation of the compilation of the register station is perfectly done by MBSTUDIO in real time; In fact, in the programming of sequences hourly and / or playlist you can define the title, the type and content type (generic advertising ‘, generic information or local); few parameters allow the generation of daily “register of programs broadcast” containing detailed real data per second; Statistics are also available daily or periodic totals Advertising ‘and / or information transmitted. The PRO version also stores the audio transmitted in a continuous cycle for 90 days. The interaction with the audience is assured by SMS and email integrated: all messages are stored with possibility ‘to create an address book and send mailing list also automatically; but the highlight is the jukebox called Musicline through which listeners can program a song simply by sending an SMS or an email containing the interpreter and the title, also written in part; MBSTUDIO automatically handles the request, make sure that the programming track complies with the rules set up by music and then inserts it into playlists communicating listener the time when refilling will transmitted or why can not ‘be transmitted. No code or number to type. Musicline jukebox is a really easy to use! And do not miss the courtesy service “Title” that sends a message to the listener with the titles of the last songs played. The software automatically directed MBSTUDIO 8 is ready for webcasting: the integrated encoder allows the transmission over the Internet using Windows Media, Shoutcast, Icecast with statistics and real-time updating of its website with the display of the playlist currently airing, including the image of the album cover or photo interpreter; you can also see the latest e-mail messages / SMS. Surely no one thinks that a computer can substitute for an animator radio show, yet the quality of the synthetic voices is constantly changing and it becomes credible use for reading short texts, to play live or to the announcement of songs wave; however you think, with MBSTUDIO it is possible to use synthetic voices in major world languages. MBSTUDIO can ‘work in a single desktop computer, a network of computers, or configuring client / server; It does not require dedicated hardware and supports both the consumer and professional audio cards interface through asio. Courtesy “Title”. By sending an SMS containing the word “title”, you receive a text message containing the list of the last songs played. The PRO version keeps all audio transmitted in a continuous cycle of up to 180 days. For general use, it is recommended an Intel or AMD CPU with a frequency of at least 2 GHz and 1GB of RAM. If used as a simple audio automation without much active services (no email, sms, rds, publications, streaming) is a computer power with minimum CPU frequency of at least 1.5 GHz. Must have at least one PCI standard (for sound card) of an RS232 serial port (If you intend to use the RDS encoder PIRA32). The case must be sufficiently ventilated and the oversized power supply for operation 24 hours 24. The minimum horizontal video resolution must be 1280. This agreement has to be considered concluded between the end user and MB SOFT, owner of ‘all rights to the software MB STUDIO. With the ‘software installation, the’ end user accepts all the terms and conditions of this contract. Otherwise you must return the dongle USB Crypto Box to MB SOFT. This contract is a mere license to ‘use of software MB STUDIO and not a contract of sale. It does not involve the transfer of ownership of this copy of the software and any other copy that the ‘end user is authorized to do under this contract. Therefore MB SOFT is the ‘sole holder of the right of ownership’ of the indicated copies of the software. This license d ‘use is delivered with a copy of the software and documentation. For the purposes of this contract for software s’ means the copy of ‘application called MB STUDIO and any improvement of the same, modified versions, updates, authorized copies of’ application. The license is made functional through one or more electronic keys that must remain permanently connected to a USB port on / of the computers where you will use the software. In no case the end user may require the replacement of the electronic key, except the case of breakdown or malfunction which will ‘necessarily follow the return. It is understood that the loss or destruction of electronic key not give rise to any right of reply to the license holder. 1) Use of Software: The end user has the right to install and use the software on each computer where it is connected to the USB dongle CryptoBox. 2) Copyright: The software MB STUDIO is an exclusive intellectual property of MB SOFT and is protected by Italian law on authors ‘(Law 663/1941, as amended), by the laws on authors’ contained in international treaties, and the laws in force in the country in which the Software is used. The structure, the ‘organization, the concept, the visual and code compilation of software constitute trade secret information for which the’ end user ‘s committed to processing software in the same way as any other intellectual work protected by the laws on d ‘author above. Moreover, the ‘user agrees not to reverse engineer, decompile, disassemble or discover the source code of the Software. 3) Transfer: And ‘forbidden to’ end-user of lease, sublicense, sell or transfer free of charge this Software and its documentation unless otherwise authorized by MB SOFT. 4) Limited Warranty: MB SOFT guarantees to ‘end user that the software functions substantially as described in the attached guide and signs posted on the site www.mbradio.it This guarantee is valid for ninety (90) days and to be able to use the ‘user must return the USB dongle CryptoBox to MB SOFT within the period of ninety (90) days. In the event the Software does not perform as warranted, the responsibility to MB SOFT and the ‘only remedy for the’ user will be to refund the price paid for the ‘purchase of the license’ to use the Software. 5) Exclusion of liability for damage: With the maximum extent permitted by applicable law and regardless of the effectiveness of any remedy set forth herein, in no event MB SOFT be liable to the user for any special, consequential or indirect similar, including any loss of profits or data arising from the use or inability to use the software even if MB SOFT has been advised of the possibility of such damages. In no event shall responsibility of MB SOFT exceed the purchase price of the software. Do you want to try MB Studio 8?